Even the most successful ads have a shelf life, and Mazda may be wrapping up the life of a long-running campaign for its Mazda 3. Research demonstrates that there are diminishing online returns for the brand’s TV investment. At the beginning of 2014, Mazda launched what could be seen as its version of Apple’s “Here’s to the Crazy Ones.“ Where “Here’s to the Crazy Ones” featured culture-shaping icons like Einstein, Dylan and Gandhi to align with the brand’s new Think Different campaign; Mazda’s “Dare the Impossible” highlighted Bruce Lee, Jackie Robinson and Frank Lloyd Wright to evoke feelings of kick, innovation and design for the new Mazda 3. 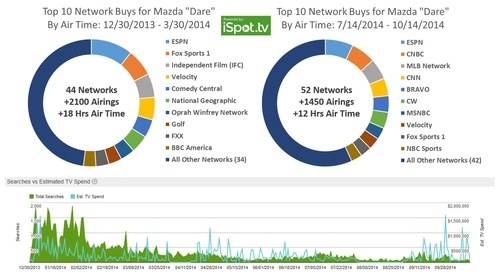 Mazda’s ad aired heavily in the early months of 2014 and drove significant online activity – more than 12 million online views and nearly 95,000 searches. After spending $25 million in the first half of the year, the brand is airing the spot again this fall with buys totaling nearly $15 million across major networks, shows and sporting events. The difference between the first three months of the campaign and the last three months can been seen in both the media placement and the online activity around the airings (see chart below). The top 10 network buys accounted for 52 percent of all the Mazda’s spend in the first three months. The buys were not necessarily broad and represented clear targeting with leading buys on niche networks like IFC, Velocity, National Geographic and OWN. In total, “Dare the Impossible” aired on TV for more than 18 hours in its first three months. In the last three months, the ad has aired for a total of 12 hours, and the top 10 network buys only accounted for 43 percent of Mazda’s total spend. The buys in these later months are also distributed across nearly 20 percent more networks compared to the first three months. This suggests narrower, more considered buys at launch, while the buys are not quite as focused in the waning months of the campaign. Finally, TV airings in these later months are not as effective at driving social activity as the TV airings in the first three months of the campaign. There is a debated wear-down phenomenon around the selling power of TV advertising. It holds that a creative’s ability to persuade erodes with media spend. Online activity is not the same as persuasion, but these diminishing online returns from TV airings for Mazda suggests the successful “Dare the Impossible” campaign may soon need a refresh.